The Saints went with a tackle in round one to help their offensive line, as they took Stanford tackle Andrus Peat in round one. Here’s a scouting report on Peat. Stanford was expecting Peat to become a very good player for the Cardinal and over the past two seasons, the team wasn’t disappointed. He was reliable in pass protection and solid in run blocking. Peat has excellent size, quickness, length and athleticism. He also has a strong lower body built to get movement at the point of attack. With his overall skill set, Peat could develop into a good left tackle in the NFL. 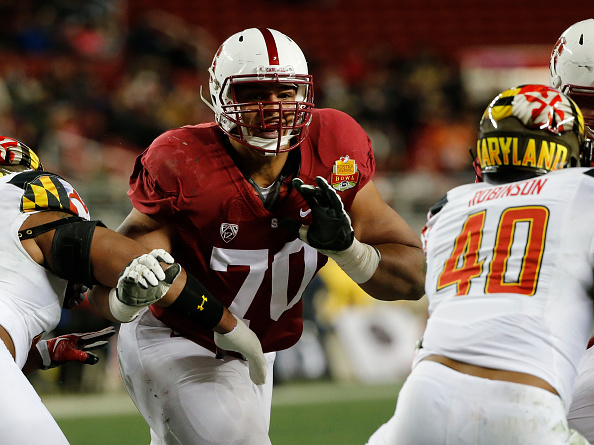 Stanford moved David Yankey inside to guard in 2013 because of Peat. Peat lived up to the big expectations in 2014. The first-year starter had an excellent debut for the Cardinal. In the ground game, Peat did a good job of opening holes and getting movement of defenders while also being a good pass-protector. He was All-Pac-12 Second-Team selection. Peat had another solid season in 2014 for Stanford while going up against a lot of good defensive linemen. The junior had a good game against USC in Week 2 and did well in his plays against Leonard Williams and was generally rock solid. However, Peat had a mental mistake on Stanford’s last play that led to a sack-fumble for the Trojans to clinch their win. Overall, he was fine against Washington, but he had a few plays where Huskies outside linebacker Hau’Oli Kikaha gave him problems. Generally, Peat won his blocks. Later in the year, he did well in his matchup with talented defensive end Owa Odighizuwa in closing out the regular season against UCLA. As a run-blocker, Peat is strong at the point of attack. When he stays low with good knee bend, he has a lot of power in his lower body to drive defensive linemen out of their gap. He is quick to the second level and strong to latch onto defenders. Peat could fit a zone-blocking or power-man scheme in the NFL. In the passing game, Peat is reliable. He can have some occasional lapses, but he has the skill set to be a left tackle in the NFL. Peat’s feet are quick enough to handle speed rushers, and he has excellent length to make it hard for defenders to get around him. Peat also has the strength in his base to hold up against bull rushes. He could use more work on his knee bend and not reaching for defenders. Sometimes that can hurt them when they cut to the inside or try and go around him.